SAN FRANCISCO, CA – The set of “A GENTLEMAN’s GUIDE TO LOVE and MURDER,” on the stage of the SHN GOLDEN GATE THEATRE in San Francisco where the Tony Awards® winning Musical is playing, represents the proscenium of a small theatre closed by a red velvet scalloped curtain. The action of the musical starts on the stage of this little theatre, when the curtain is raised. Because most of the action takes place within the confines of this “small theatre”, instinctively we know that what we, the audience, will see on this small stage will be a play, “acted” with realism by the players, who expect that we understand that A GENTLEMEN’s GUIDE TO LOVE and MURDER is a parody. Its story. “a spoof” of life. A well-structured story told with music, lyrics, and almost no dancing, that uses humor, in this case “dark humor”, to prove the power of the mighty dollar. In this play, even murder pays. The book of the musical is based on the l907 novel Israel Rank: The Autobiography of a criminal written by ROY HORNIMAN. Its book and Lyrics were writtenby ROBERT L. FREEDMAN and its music and lyrics by STEVEN LUTVAK. The structure of the musical resembles an English mystery: It has aristocratic characters, intrigue, and crimes. And the musical let the audience know what to expect from the beginning. Its Prologue, opens in a cemetery, where a group of characters dressed in mourning attire, stand in front of the D Y Squith grey color mausoleum (on the small’s theatre’s stage) singing: “A Warning to the Audience.” In its lyrics, the song invites those people in the audience with weaker constitution to leave the theatre because the events about to unfold may disturb them. The “warning” is another spoof. The action in the musical is presented as in short scenes most of them acted within the confines of the stage of the small theatre. There is plenty of action in the musical, and it moves very fast. The scenery changing constantly from indoors to outdoors. We should add that The interior and exterior designs (by ALEXANDER DODGE) combined with the lighting designs (PHILIP S. ROSENBERG) the projection designs (AARON RHYNE) and the English costumes (LINDA CHO) make each individual scene a masterful rendition of a visual art. This musical has also many characters, so most of the actors, except the principal characters, play more than one role. All the actors sing well and their different characterizations of their different roles are excellent. 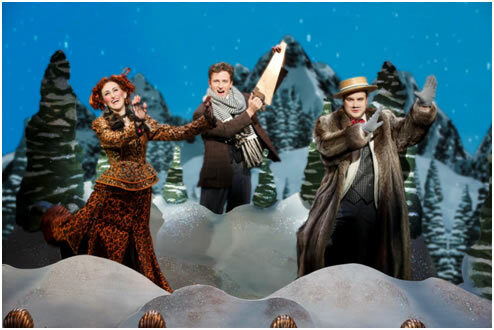 L-r Miss Barley (LESLEY MCKINELL, Monty Navarro (KEVIN MASSEY) and Henry D’Y Squith (JOHN RAPSON ice skating at a resort. The protagonist of the story in this musical is charming Lord Montague D’Y Squith Navarro, the ninth Earl of Highhurst, (KEVIN MASEY) who we meet sitting on a chair in front of a table ( located outside the small theatre) telling the audience that while few people tells the truth about themselves he had resolved to write his memories faithfully to the truth on the eve of his possible execution. The name Monty, as people calls him may give the audience another clue of what to expect from this musical. In “How to Succeed in Business, without Even Trying” (another "spoof" musical), its principal character is also named Monty. He is a window washer, who after reading a book on “How to Succeed” schemes his way up to the CEO position in the company where he washed the windows. In "A GENTLEMAN's "musical, when our Monty becomes ambitious he also finds a way to move up fast, but not to a CEO position, but to the Earl’s line. And like the Monty in the “How to Succeed” story. He does it for love. 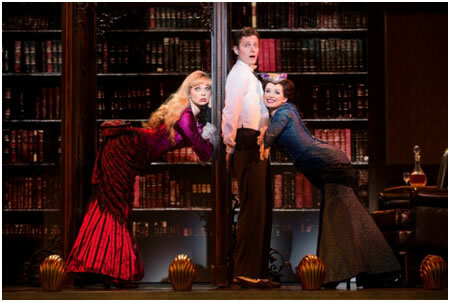 Our Monty is in love with Sibella Hallward, a beautiful blond who is in love with luxury and money. So, when at his mother funeral Monty is told that now he is 9th in line to the title of "LORD" and to the fortune of D’Y Squith because his mother is a D’Y Squith daughter, who got rejected by her family when she married a poor Castilian Spaniard, Monty gets excited. Directed by DARKO TRESNJAK the acting in this show is seamless. In spite of their short parts, all the characters are three- dimensional, and believable in their comic roles. 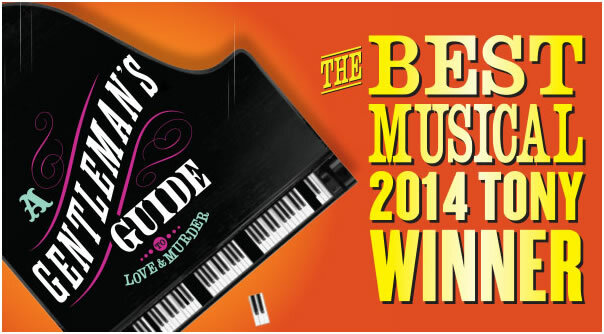 The music in the musical is pleasant, the lyrics funny and all the songs are sang well. The outstanding part of this musical, however is the scenery which for a theatrical production is amazing. And because of its absurd plot “A GENTLEMAN’s GUIDE TO LOVE AND MURDER keeps the audience pondering all night: what is our hero going to do next? how? And what will happen at the end?